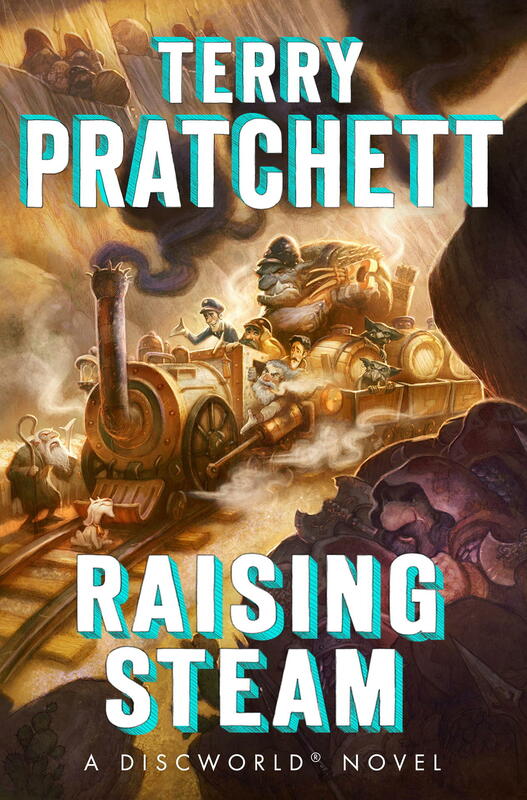 Terry Pratchett’s new Discworld book, Raising Steam, has been out in the UK for months. Finally US readers get a crack at it as it is officially released in the US today. Run to your bookstore! Run, I say! Raising Steam takes place in the fantasy world called Discworld. This is part of a huge series of more or less stand alone books. In each book, Pratchett takes a satirical, usually hilarious, look at some element of modern life. My personal favorite, Maskerade, makes affectionate fun of opera and of the Phantom of the Opera. The Truth sees Discworld get its very first newspaper. Guards! Guards! introduces us to the police force…and so on. My advice on where to start is to see where your passions lie and follow that trail, although I’ve listed some specific suggestions at the end of this review. Raising Steam sees the invention of the first locomotive. Lord Ventari is, of course, anxious that this new invention not destabilize his realm, and he puts Moist Von Lipvig, a reformed con man who has already fixed up the postal service (Going Postal) and the bank (Making Money), in charge of making sure the railway is built, and that the railway is built in such a way as will work to the advantage of Lord Ventari. Meanwhile, the dwarfs are experiencing civil unrest over the fact that dwarves are leaving the mines for the big city, and working with and even marrying trolls and humans. Most of the social commentary in the book comes from the sections regarding dwarves. I loved this book, but its tone is a little different from the earlier Discworld books, including those featuring Moist. The humor is sharp but less laugh-out-loud in nature. In fact there are very few sections during which I whooped with laughter, or rushed to quote a passage. The Discworld books have always had some serious points to make, and my sense with this book and the previous book, Snuff, is that Terry Pratchett has no interest in messing around – if he has a point to make, he’s just gonna come out and make it. Terry Pratchett has a rare form of early onset Alzheimer’s which does not affect his ability to make books although he can’t actually physically write or type (he dictates them). I haven’t noticed any problems with his more recent books in terms of writing quality. The only difference I observe is this switch to a more serious, pointed tone – which is saying a lot, since the Discworld books have always been pointed and often quite dark, despite an overall sense that goodness and hope struggle to persist, no matter how mad the world may be. This sense continues to pervade Raising Steam. Pratchett’s writing seems more urgent to me in his last couple of books, but that may be less a matter of what’s happening with him and more a matter of what’s happening with me, a devoted reader who hears the clock ticking on a beloved series. The dwarf plot and the train plot go together in a way that feels less like a natural progression of the story and more like someone trying to figure out how to connect two completely different plots and saying, “Well, we could always do this”. Toward the end a whole new dwarf thing is introduced, which means we get all our social metaphors packaged together. I’d sum it up as a message that inclusion and diversity are good things. This didn’t bother me too much because as messages go I’m quite fond of the messages involved in the dwarf storyline, but it the message was a bit heavy-handed even by Discworld standards. If you are deeply opposed to things like legalizing gay marriage, or equal opportunities for women, or racial and ethnic diversity, then you won’t like this book although I’d argue that you certainly ought to be reading it. The Color of Magic: The very first Discworld book! This one introduces the wizards. Equal Rites: Introduces my very favorite characters – the witches. Guards! Guards! Meet the City Watch! Going Postal: Moist von Lipvig is introduced and stamp collecting is born. My personal favorites: Maskerade, Lords and Ladies, Carpe Jugulum, Hogsfather. Of those four, three are about the witches so I guess there’s some bias there. I did not read the series in order and you don’t have to either. Just have fun with it! This entry was posted in Book Reviews and tagged Discworld, fantasy, humor, Raising Steam, Terry Pratchett. Thanks, glad you liked it! Are you a Discworld fan? Sir Pratchett is, and always has been, a unique writing talent. He’s one of my favorite writers. Perhaps the fact that the version of Alzheimer’s he has manifests itself physically more than cognitively will allow him to continue to write for years to come. Sir Pratchett is one of my heroes. I love that one thing he did right after his diagnosis was start a new series (The Long Earth, with co-writer Stephen Baxter). That’s optimism! And it seems to serve him well as he continues to write and advocate for right to die issues.